KAMPALA. Police on Monday released Security and Traffic guidelines for Martyrs day where aerial surveillance operations by police helicopters started and will go on until the celebrations are finalized. Kampala metropolitan Police commander CP Moses Kafeero assured the public and pilgrims that security preparations have been finalized and that police and other sister security agencies are already in place to ensure safety. Kampala Metropolitan Police Commander, Moses Kafeero. “We have the inner most and outer security rings in place prepared for the event” Kafeero Said while addressing the media at Namugongo martyrs shrines. The guidelines released will be followed by both the pilgrims and the general public around Namugongo, he added. Police also urges parents to minimize moving with children in order to avoid cases of missing children. However, the police have put in place special tents that will handle any cases of the nature that will be manned by our child and protection unit. The Kampala Metropolitan traffic commander SSP Norman Musinga issued guidelines which he said shall be enforced on Sunday. 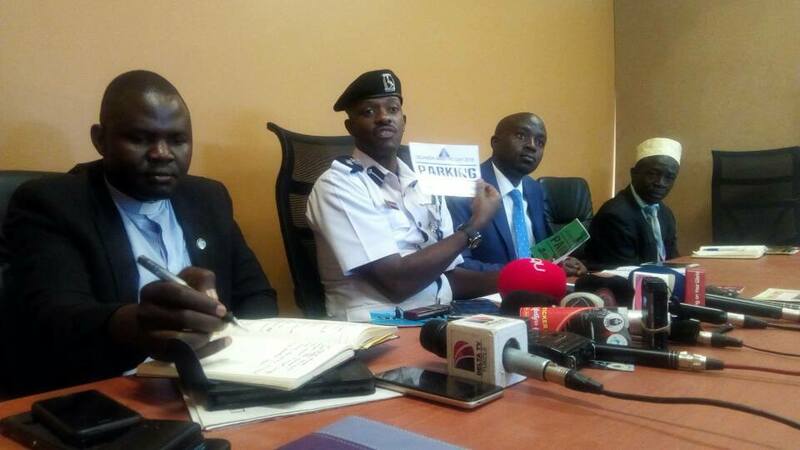 Kampala Metropolitan Traffic Commander, Norman Musinga issues guidelines. Musinga revealed that no vehicles shall be allowed to park at both shrines in Namugongo to avoid over congestion. He said traffic police have issued different stickers to vehicles showing their parking on Sunday. “Only vehicles with red VVIP stickers shall be allowed parking adjacent to both shrines through Kyaliwajjala road,” said Norman Musinga. Pilgrims from Eastern route shall access Namugongo via Bweyogere-Buto road and park at the Protestants play grounds, while those from Western and Northern Uganda will use the Northern bypass at Nalya round about. Musinga adds that foreign pilgrims will be dropped of Kyaliwajjala and their vehicles will park at Vienna College. However, “Barriers will be put in place to allow emergency vehicles to access the Venue, said Musinga.